Collections of up to 25 different pieces of foreign currency. 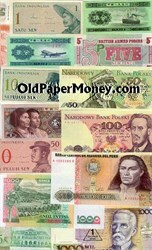 Includes China, Brazil, Great Britain, Hong Kong, Mozambique, Peru, Poland and more. Most are legal tender in their issuing countries. Small to US dollar size. Dates are from the 1960's - 1990's . All 25 Bank Notes are CRISP and UNCIRCULATED. 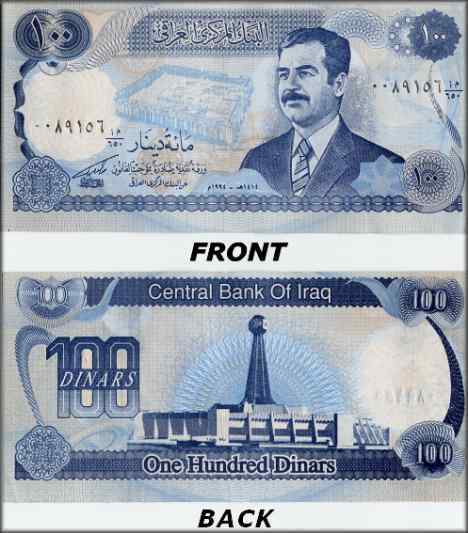 Each set will also include a MINT UNCIRCULATED CRISP authentic 100 DINAR NOTE with a portrait of Saddam Hussein on the front as shown below. These are no longer being used in Iraq. These are great for collectors, kids, party favors, going away presents, and general purpose gifts.